Researchers at Brigham and Women’s Hospital and MIT have designed a compact cell sorter that requires no additional parts or steps. Their cell-sorting microchip takes in mixtures of cells that flow through tiny channels coated with sticky molecules. While flowing through these channels, the cells with specific receptors bind weakly to the sticky molecules and roll away from the rest of the flow into a separate receptacle. Cell rolling is a common mechanism cells use to navigate through the body. During inflammation, for example, the endothelial cells that line blood vessels present certain molecules that attract white blood cells just enough to divert them from the rest of the vessel’s cellular traffic. White blood cells then roll along the vessel wall, slowing down to help in the healing of inflamed areas. Researchers at MIT and Brigham and Women’s Hospital have now designed a cell-sorting microchip that takes advantage of this natural cell-rolling mechanism. The device takes in mixtures of cells, which flow through tiny channels coated with sticky molecules. Cells with specific receptors bind weakly to these molecules, rolling away from the rest of the flow, and out into a separate receptacle. Karnik collaborated with postdoc Sung Young Choi of MIT and Jeffrey Karp, co-director of the Center for Regenerative Therapeutics at Brigham and Women’s. 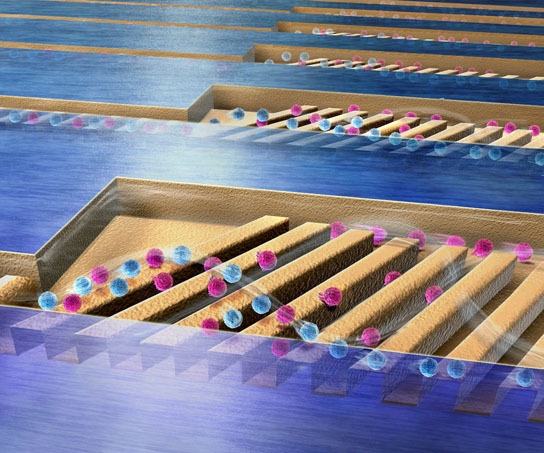 The team reported their findings in a paper posted online in the journal Lab on a Chip. While current cell-sorting technologies separate large batches of cells quickly and efficiently, they have several limitations. Fluorescence-activated cell sorting, a widely used technique, requires lasers and voltage to sort cells based on their electric charge — a complex system requiring multiple parts. Researchers have also used fluorescent markers and magnetic beads that bind to desired cells, making them easy to spot and sift out. However, once collected, the cells need to be separated from the beads and markers — an added step that risks modifying the samples. Karnik’s team designed a compact cell sorter that requires no additional parts or steps. The team built upon their 2007 work with MIT’s Robert Langer and others, in which they first came up with the sorting-by-rolling principle. Since then, the group has been turning principle into practice, designing a working device to sort cells. The initial proof-of-principle design was relatively simple: Cells were injected into a single inlet, which gave way to a large chamber coated on one side with sticky, roll-inducing molecules. The incoming cells flowed through the chamber; the cells that bound to the molecules rolled to one side, then out to a collection chamber. Karnik says the device may be replicated and stacked to sort large batches of cells at relatively low cost. He and his colleagues are hoping to apply the device to sort other blood cells, as well as certain types of cancer cells for diagnostic applications and stem cells for therapeutic applications. To do that, the team is investigating molecules similar to P-selectin that bind weakly to such cells. In the future, Karnik envisions tailor-made cell rolling, designing molecules and surfaces that weakly adhere to any desired type of cell. The device is a “smart design,” says Milica Radisic, an associate professor of biomedical engineering at the University of Toronto, who was not involved in this research. Radisic says because the device relies on hydrodynamics within the chamber, it doesn’t require external equipment. Be the first to comment on "Researchers Design Cell-Sorting Microchip"